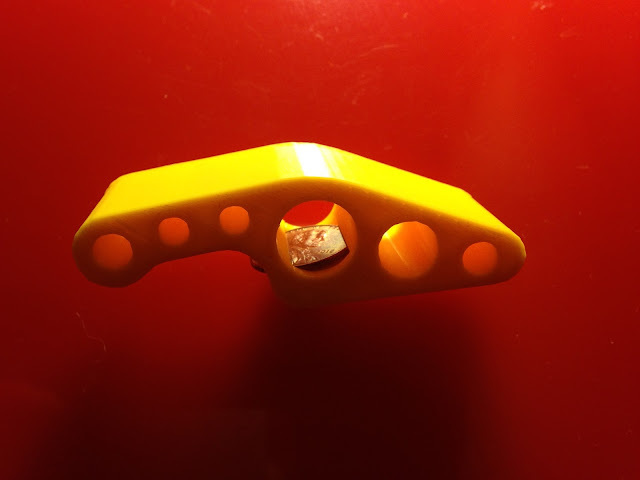 Today something very simple: a minor remix of hoeken's lovely minimalist Coin-op Bottle Opener on Thingiverse, with holes added for style and so you can see the penny better. Settings: On MakerWare "low" with no raft or supports this takes about 30 minutes to print. Technical notes: The boundaries of the holes that I added actually *increase* the print time and plastic used, compared to the sparse honeycomb fill that would have been printed inside if the model had been solid. Also, I couldn't fit a US penny into hoeken's design when printed on our MakerBot on "low", so I made the coin slot larger in these designs.